Tarot card deck. Photo by Leina Amatsuji-Berry. Can tarot truly be applied to the real life biographies of notable members of the Trent community? This pitch may seem far fetched, however my treatment in previous articles in this series shows that tarot and monomythical archetypes can be applied to film and contemporary biographies. In this final article in this multipart series, I apply tarot to four of Trent University’s nine former Chancellors, and remark on my findings. Oil portrait on canvas of the Honourable Leslie Miscampbell Frost. Varnished, ornate gold painted frame. Image via Bata Library, Trent University. Card 4, The Emperor, depicts a masculine, war waging king representing service in military and politics. The Honourable Leslie Miscampbell Frost, first Chancellor of Trent University (1967-1973) served in the Canadian military in World War I and as Premier of Ontario (1949 to 1961), heralding and spearheading an era of state-funded publicly accessible higher education. Eugene Alfred Forsey, while a professor at McGill University, circa 1930. Image via Wikimedia Commons. Card 11, Justice, represents taking responsibility and embracing your ethical obligation to overturn an otherwise unjust status quo. The Honourable Eugene Alfred Forsey who was the second Chancellor (1973 -1977) was director of the Canadian Labour Congress for a time, committed to the ideals of economic justice. 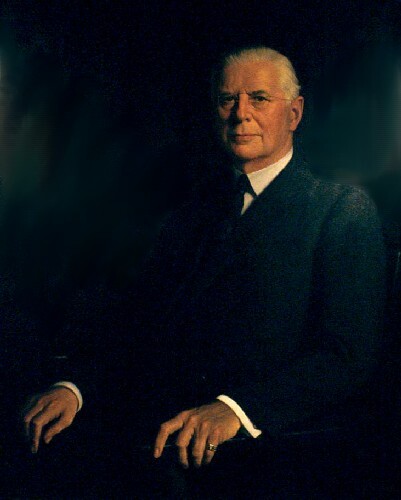 Forsey worked diligently to make ethical public policy at the foundation of our economy. 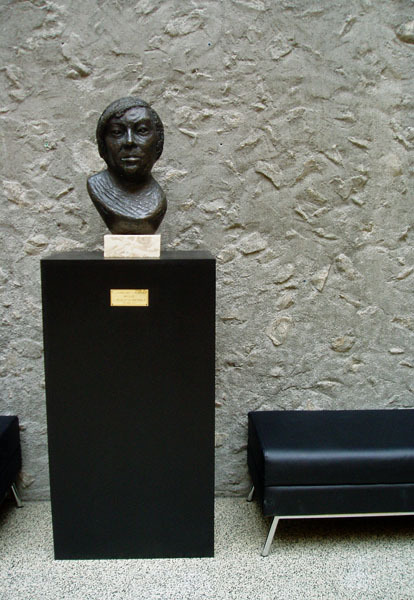 Bronze sculpture bust of Margaret Laurence on marble base and wooden stand. Image via Bata Library, Trent University. Card 20, Judgement, a symbol of liberation and weighing the truth within factors of a given scenario, and above all, finding forgiveness and arriving at a mutual understanding. Jean Margaret Wemyss Laurence, fourth Chancellor (1981 to 1983), is remembered for embodying the values to which the academy aspires to achieve: informed and balanced criticism, humanitarianism, self-reflection, humility, discernment and renewal. Roberta Bondar in Trent University regalia. Photo via Trent University. Card 21, The World, can represent celebrating an accomplishment and achieving a reward from a long life or journey of work or productivity. Roberta Lynn Bondar, ninth Chancellor (2003 to 2009), is Canada’s first female astronaut who photographed the world from outer space, winning international awards of recognition as an inspiring leader among Canadians, and women globally. The twenty-two tarot archetypes are universally applicable to any contemporary work of fiction (like novels or movies) or any individual personal life story (like biographies). Tarot is also applicable to you, and to everyone of us, on a personal level. Some psychics are experts at tarot and can guide you through an insightful interpretation of a spread. The authenticity of a tarot reading can only be verified by the client’s own intuition and inner knowing. The seeker is the ultimate arbiter and judge of the quality of a psychic’s reading. The messages conveyed by psychics to you personally will only resonate sometimes. The more experienced, well read and gifted the psychic is, the better. Some psychics can be charlatans and dupes while others are legitimate. I trust and personally recommend Toronto’s Carolyn Molnar, Canada’s “Barefoot Prophet” Paul Pacific and Peterborough’s very own psychic and medium, Rev. Judy Morgan. For further reading on tarot I recommend Aleister Crowley’s The Book of Thoth. For those starting out, I recommend Sarah Bartlett’s helpfully accessible introductory work, The Tarot Bible. Of course, a tarot reading list wouldn’t be complete without Paul Foster Case’s remarkable esoteric opus, The True and Invisible Rosicrucian Order. The last book there as it appears on Amazon is a forgery. If you want a genuine copy, go to the source. Get it from the official Builders of the Adytum website. As part of my closing thoughts, I’d also like to thank TrapNation’s SXSW Mix and all the sundry melodic dubstep and rap musicians on YouTube who deserve credit for inspiring me to ask Arthur to publish these articles. My argument in these articles is not that my audience ‘should’ begin learning about or practicing tarot. I’d like to emphasize that you don’t have to study tarot to appreciate humanity’s relationships with each other and the cosmos. I’m not trying to convert any one. I am merely demonstrating or observing the collective, universal application of archetypes to the human condition and to Trent’s former Chancellors. Waving my hand from a distance I am presenting a non-argument. I am merely sharing unordinary interpretation of film and biography because it’s fun. Like with any host of archetypes in general, tarot specifically can provide the student with a higher vantage point. Tarot will not cure cancer, nor alleviate the serious and urgent disruption of Earth’s climate, nor gently dismiss our beloved yayhoo in the White House from office; but if you are into historical biography, literary theory or the social sciences, tarot is a gift from the Creator. The author of this four part series is “The Initiate”, a Trent alumnus who majored in Philosophy from 2003-2008 and who can be reached at [email protected]. This four-part series is available in full at www.theinitiate.agency with more essays by the author over at www.summitministry.coffee. Read parts one, two and three.